3) Send an email to them with Chatter Group link to join Chatter Group, So as soon User clicks on the link they will auto join Chatter Group. You can also use this technique to promote your Chatter Group. 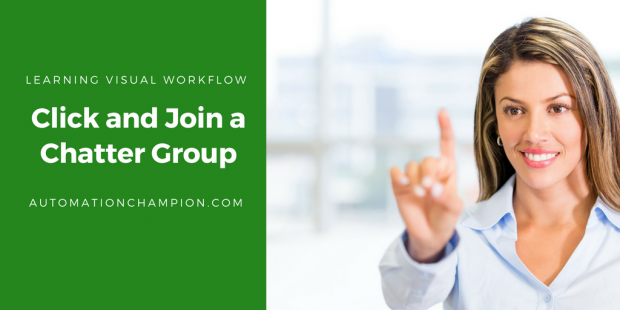 In this article I will discuss how you can provide a link to join Chatter Group in an email to your users, So they will Join Chatter Group as per their interest. Management in Universal Container wants to send an email to their Salesforce users with a link to join new Chatter Group “Dreamforce14“, so they will auto join “Dreamforce14” Chatter group as soon as they click on the link provided in the email. 1) CollaborationGroupId: – ID of the private Chatter group. 2) MemberId: – ID of the group member. 8) Save the flow with name Dreamforce14 and close the canvas. In the above code, I used the ID of Chatter Group Dreamforce14 to auto redirect to Chatter Group home page as soon as the flow execution will be completed. P.S. :- I will suggest you to Implement this first on your developer org test it and then move it to Production. Let me know if you have any difficulty to Implement it. Mind blowing Rakesh! You are rocking.